The book is called Food Artisans of Alberta and showcases the producers behind some of the best locally crafted cheese, organic berries and vegetables, humanely raised bison and much more. 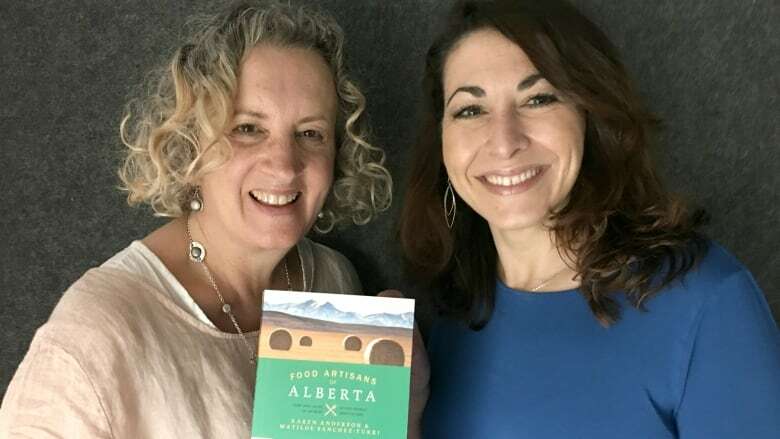 Karen Anderson and Tilly Sanchez-Turri are calling their new book a love letter to Alberta's food producers. It's called Food Artisans of Alberta and showcases the producers behind some of the best locally crafted cheese, organic berries and vegetables, humanely raised bison and much more. Anderson is a cookbook author and founder of Alberta Food Tours. Sanchez-Turri is a passionate baker and foodie who does food tours. The pair appeared on The Homestretch on Monday to discuss the book. Q: Why did you focus on artisan producers here in Alberta? A: [Anderson] I think there's lots about books about chefs … but our farmers and food artisans, our ranchers and cheese-makers, they're just not getting enough light shone on them, so this was a chance, an editorial book, where we get to choose the people doing the very best. Q: It reads like a love letter, how would you describe your love affair with food? A: [Sanchez-Turri] It's been long and beautiful and it's a total privilege to be able to have written this book. Q: Can you give us a sense of the type of producers you talked to? A: [Anderson] We were really looking for people with sustainable, organic models of success. The average age of a farmer in Alberta is about 60. There's less than 10 per cent under 30, so we were looking for people that had great practices that would maybe be models for younger farmers to get back in, or younger farmers that had great ideas. So there's ranchers, farmers, cheese-makers, sausage-makers and bakers, and then chefs that use a ton of local [products] because they too are models. A: [Sanchez-Turri] There were so many. Mans Organics down in Coaldale, they're growing all kinds of produce, hemp, and they're also producing watermelon, canteloupe — all kinds of things. In the north, I was surprised by the production of wild rice, up by Athabasca. [Anderson] Wild rice is native to Canada, mostly in Manitoba, but at one point there were dozens of wild rice growers, now we're down to one, Lakeland Wild Rice, the Ptolemy family, and they have 1,000 acres of wild rice cultivated on four little lakes back in the bush. So back I went on a very cold September morning to get their photo and to capture that, because I think it's really special what they're doing. [Sanchez-Turri] For me, I'm a huge bread-lover, so it was travelling many of these farms and seeing heritage grains being grown again. Q: For people who maybe have a problem with gluten or other dietary restrictions, what's in the book for them? A: [Sanchez-Turri] I think people will be delighted with the plethora of ingredients, the seven signature foods of Alberta — beef, bison, canola, honey, red fife wheat, root vegetables and Saskatoon berries, and that's just the starting place.